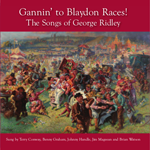 Blaydon Races was written in the 1800s by Geordie Ridley, deriving from music hall. 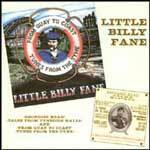 It is regarded by many as the unofficial anthem of Tyneside and is frequently sung by supporters of Newcastle United Football Club. Blaydon itself is a small town in the Metropolitan Borough of Gateshead and it is about 5 miles from Newcastle upon Tyne in the north-east of England. Away we went alang Collingwood Street, that's on the road to Blaydon. Gawn alang the Scotswood Road, to see the Blaydon Races. Just gannin' doon te the railway bridge, the 'bus wheel flew off there. An' aw got two black eyes an' a broken nose in gan te Blaydon Races. An' sum sought out the Infirmary to mend their broken ribs. Aw danced a jig an' swung my twig that day aw went to Blaydon. 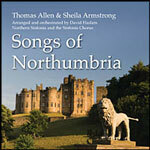 To gan an' see Geordy Ridley's concert in the Mechanics' Hall at Blaydon. Coffy Johnny had a white hat on - they war shootin' "Whe stole the cuddy." An' a chep wiv a hapenny roond aboot, shootin' "Now, me boys, for riders." Passin' the folks upon the road just as they were stannin. Gannin alang the Scotswood Road to see the Blaydon Races. Ridley sang the song at a concert in Balmbra's Music Hall on 5 June 1862. It is likely that on this occasion the song ended with the exhortation to see Ridley's show on the 9th, and that the final verse was added for this later performance. Although the account of the trip to Blaydon is a fiction, the heavy rain and missing cuddy (horses) were reported in the local press. Airmstrang's factory was the engineering works at Elswick. The Robin Adair was a pub on Scotswood Road. Paradise is a suburb of Newcastle. The Blaydon Race is a 5.7 mile athletics race from Newcastle to Blaydon that takes place on June 9 every year and starts off with the singing of The Blaydon Races – with the words as the basis for the race.